Inflationary pressures, particularly food inflation, continue to percolate across some emerging markets nations. Central bankers don't like openly discussing the problem, fearing just talking about it could raise inflation expectations. But that does not make the problem any less real. India: Even though the wholesale inflation (WPI) remains under 8%, it has not declined further in spite of India's economic slowdown (see post), and actually rose last month. 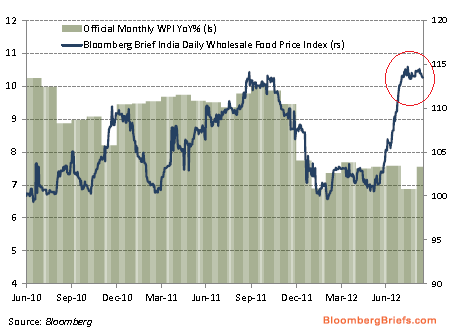 At the same time food prices remain elevated. Bloomberg: - The Reserve Bank of India may focus on inflation as it meets today, especially after the U.S. Federal Reserve’s decision to embark on a third round of quantitative easing. Previous rounds of easing have stoked foreign capital inflows and increases in commodity prices, especially oil. [Indian] wholesale price inflation accelerated to 7.55 percent in August, the highest level in three months, and remains well above the 4 percent to 4.5 percent range where the RBI intends to anchor inflation expectations. The central bank will also be concerned about potential spillover effects from the spike in global food prices. Russia: The central bank actually had to raise rates due to concerns about inflationary pressure. WSJ: - The Bank of Russia unexpectedly raised interest rates across the board on Thursday for the first time in nine months, as it struggles to contain increases in food prices and inflation while the economy slows. The central bank said its decision to raise rates by a quarter of a percentage point was driven by a sharp rise in the rate of inflation in August and early September that had exceeded the bank's "medium-term targets." The benchmark refinancing rate was increased to 8.25% from 8%. The decision caught some economists off guard. Eight of 11 economists polled by Dow Jones Newswires before Thursday's announcement had said they expected the central bank to leave rates. Some other nations are seeing a pick up in prices as well. Bloomberg/BW: - Indonesia’s inflation unexpectedly accelerated in August on rising food costs, limiting scope for the central bank to cut interest rates even as exports slumped for a fourth month. Clearly slower global growth and weak manufacturing should keep inflation in check, but as monetary expansion in the US and the Eurozone picks up, these "inflation surprises" may become more commonplace.